A new report has exposed the details of a heated meeting held between Palestinian Authority (PA) Chairman Mahmoud Abbas and Qatar-based Hamas politburo chief Khaled Mashaal on August 21 in Doha, in which Mashaal apparently submitted to a ceasefire with Israel. Abbas's rage over the news reportedly boiled over in the Doha meeting, which was attended by Qatari emir Tamim bin Hamad al-Thani, his foreign minister, senior members of Abbas's Fatah faction including Saeb Erekat and Azzam al-Ahmed, and Hamas deputy politburo chief Mousa Abu Marzouk. 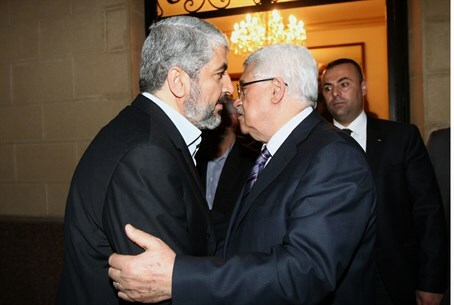 "I don't want to return to the past," Abbas reportedly told Mashaal, noting on the April PA-Hamas unity deal. "I gave the Qatari emir all the details. We agreed on a unity government and elections." However, Abbas threatened "that might not happen because you are smuggling weapons, explosives and money to the (West) Bank - and not to fight Israel, but to hold a coup against the (Palestinian) Authority." Detailing his early August meeting with Cohen, Abbas told Mashaal he was informed about "a group that was arrested, which planned to carry out a coup. Why a coup? This needs to end." Mashaal then complained to Erekat about the berating according to the report, saying "I don't know anything about the ISA's information, and no one updated me about it." "We are partners with Abbas, we respect him, and his right to criticize is apparent, but from the start of the meeting he's been irritable. He relies on Israeli stories about a coup, and says he doesn't trust us - that's unacceptable!" said the exasperated leader of the terrorist group Hamas. Mashaal then pressed his denial of the detailed ISA reports, saying "it's sad that you choose to believe Israeli sources. On the honor of Qatar and the emir, I say - this is 100% a lie." Further tensions in the Hamas-PA unity government, which recently revealed it is completely bankrupt, were raised in the meeting over the Hamas abduction and murder of three Israeli teens on June 12. Hamas leader Salah Al-Aruri in Turkey late last month finally admitted his group was behind the horrific murder, after Hamas leaders had long repeated their denial. "You kidnapped three children. I asked you about it, and you didn't confirm or deny. Yesterday Al-Aruri said they were the ones who did it. Why? What's the goal of that? To destroy the (West) Bank?" asked Abbas of Mashaal. The PA leader warned that things would be changing, saying "in (Operation) Pillar of Defense you did what wanted, and we weren't there. Now we are working with you, and the current situation is unbearable." Abbas also presented his plan to demand the UN set a deadline for Israel to withdraw from the 1949 Armistice lines. "After 20 years of failed negotiations, Israel and the US haven't brought us anything and the occupation continues," said Abbas. "We are setting a national strategy like this: Israel and the US will agree in writing to a Palestinian state on the '67 borders with eastern Jerusalem as it's capital and defined temporary borders." "We'll start immediately with a border outline during a period that will be set in advance, and afterwards we will discuss the topics of a permanent agreement," said Abbas, detailing his plan to press Israel to leave its biblical heartland without any agreement in place. If the US and Israel do not agree, and indeed both have already expressed opposition to the plan, Abbas noted he would stop the security arrangements and all cooperation with Israel, dismantle the PA - a threat made numerous times in the past - and give Israel control over Judea and Samaria. It is worth noting that the 2012 Levy Report, which has yet to be adopted by the government, revealed that an Israeli presence in Judea and Samaria is not an "occupation" according to international law.